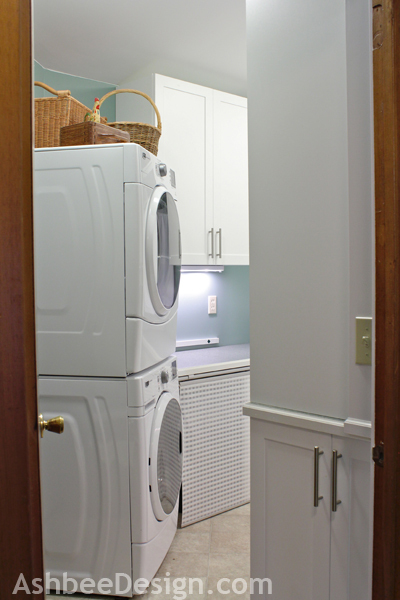 Ashbee Design: Laundry Room Reveal!!!! 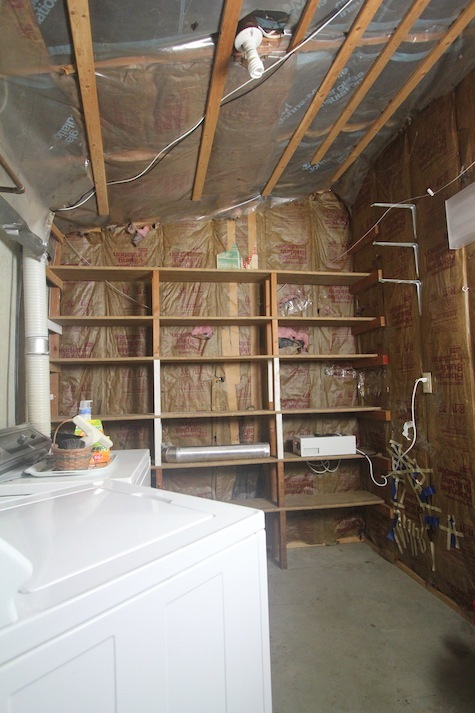 I think trumpets should sound right about now because finally I am bringing you the laundry room reveal. I have a lot to share with you but I won't keep you in suspense, I'll cut right to a couple of pictures so you can see, but then read on for more info. Yup - unfinished space on my main living floor. The room was always too critical to disassemble and finish. But this was the year! And now, months later I now have a glorious, functional, practical space! As you approach from the kitchen, you get a hint of the clean, crisp design. Enter and a wonderful space is revealed. As a quick reminder for those that have been following, I first let you know that this was my BIG project for the year back in March. Is it really 9 months later? 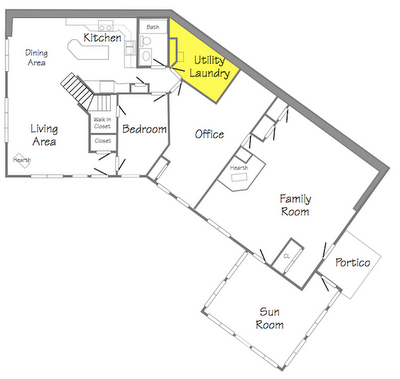 Here is a floor plan of my first floor with the laundry room highlighted in yellow. 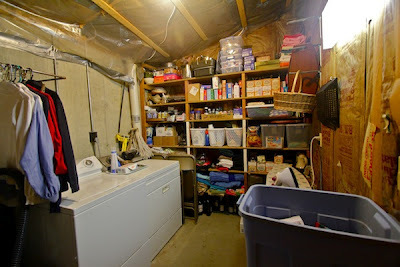 It is my utility room, laundry and pantry all rolled into one space. Our house is a berm house built after the energy crisis in the 1970's. The back wall is below grade with no windows. If you look at the before photos you can see it is a concrete wall. This laundry room has no natural light so I went with bright white cabinets. There is no doubt that a skylight would be a wonderful addition but all the energy savings would escape right through that skylight. 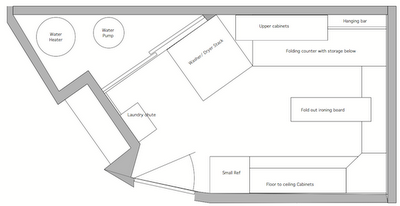 Here is the floor plan of the changes I wanted to implement. I knew from the beginning that this was not a DIY project. I was relocating all the mechanicals, expanding electrical capabilities and would need qualified tradespeople. I was the general contractor and went about making this dream a reality. If you are interested in the process and the story follow these links to posts from the past year. Over the up coming holiday week I will continue to post a series of details about the new laundry room.... Like where is the ironing board? And the IKEA Hack! Check back as I share some of the decisions, some of the mistakes and the successes. Still to go is the decorating. There are several blanks walls in there just begging for more creativity. Finally! I have been so curious and it looks wonderful! As the holidays are here, I am so jealous of that extra counter space and the beverage fridge - so handy! I think you did a good job in making the best possible use of what seems to be a small and oddly shaped space. I can't wait to read about the details later on - my family will come after Christmas so I have a period of leisure before it gets chaotic again! Congratulations and Merry Christmas! Thank you for following the process. The new laundry worked beautifully for Christmas entertaining. Staged from there, containers got stored there, dirty pots got placed there. Helped keep the open kitchen clean during the big family party. Such a help! Happy New Year! Oh wow...your laundry has turned out so wonderful. 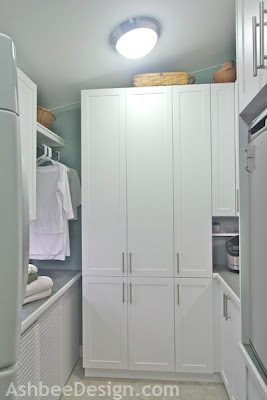 Love all the crisp white cupboards almost would make you feel like going in and washing. Thanks for sharing the photos and wishing you and your family a terrific Christmas. No doubt about it - it is much more pleasant doing laundry in this new space! I used to carry the laundry out to my bed to fold it. Now I stay in the laundry and fold and stack. Huge improvement. Happy New Year Merry! Wow! That's gorgeous! What a wonderful Christmas gift! It certainly was wonderful to have it done for Christmas entertaining! Everyone even wanted to see it. My tiny laundry room often had five adults squeezed in looking at the new space. My January assignment will be creating a few special objects for the walls. This is fabulous, Marji! I would spend all my time doing laundry. Love it. I find myself hanging out in there a lot. I set up craft projects and work on them, I just putter in there because I love the space so much. Thanks for visiting and commenting. Hi Gretchen, Yes, very dramatic. It took a long time to be willing to be with out the laundry room for an extended period. But this was the year! And because I knew I won't re-do if for many, many more years, I spent a long time planning and tried to do it right! Thanks for visiting and commenting. Hi Jamie, this was about as serious as it gets for a room re-do. Upgrading the mechanical systems had me most nervous but the end result was worth it. We have much better water pressure, and it is filtered! But the part I love is the clean, crisp design. It is such a pleasant spot. Thanks for commenting. I love it. My "laundry room" really isn't much more than a closet but I am hoping to turn it into a pretty, practical closet in the next couple months. Go for it Rose. there are many great ideas for closet laundry rooms on the web. It doesn't need to be just utilitarian. You can aim for beautiful as well. Thanks, the change is huge and I am sure it greatly increased the value of our house not to mention I enjoy working in there so much more now! Looks great! I love all the custom details you added! Yup! that's what one can do after planning for 33 years. You know what you need!!! Beautiful re-do! I'm inspired to do something about my laundry room. Not a lot of space, but could be re-organized for more storage. Thanks! Mine looks large in the pictures because I needed to use a VERY wide angle lens to photograph it. It isn't large and I squeezed a lot into it. Just required careful planning. Marji!!!! You have a DREAM Laundry Room!! WOW!!!!!! Stunning! 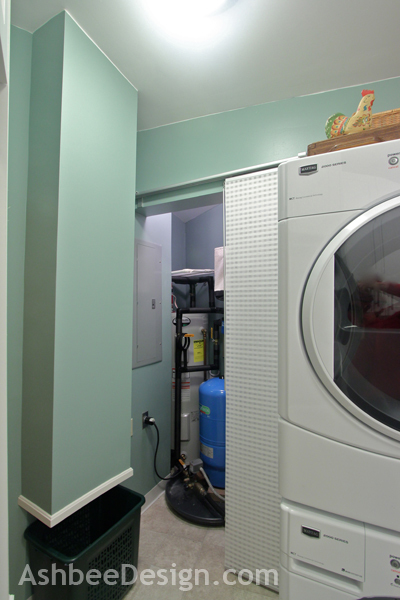 Marji, wonderful job transforming this laundry space from dismal to divine! Is that a laundry chute I see? Excellent! Dismal to divine! Great word choice! Yup, it is a laundry shoot. That was in the original space. I had that installed when we finished the upstairs bathroom. We built our own house and only finished four rooms before moving in. We finished each room upstairs as each daughter was born. The bathroom finally was finished as they were entering middle school! At that time we installed the shoot from the kid's bathroom down to the laundry room - hugely effective! 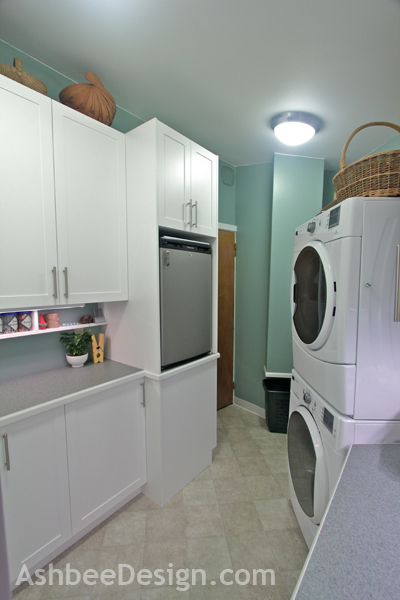 Just found your laundry room reno story and love everything, from your design/thinking process to the outcome! So many thoughtful ideas.....hope to use a few when I get to my own laundry room project. Glad they inspired you. I know I relied heavily on web inspirations in planning this space. Wow! I love the clean and simple look. And the wall color! What a great job. Wall color is Benjamin Moore Del mar Blue 068-704. It was tough to photograph and often looked different but it is a very soft blue green. WOWZA this is gorgeous! Featuring later today! OMG! What a transformation!!!! Beautiful and great choice on the cabinetry and handles! love it! WOW!!! It looks so utterly fabulous!